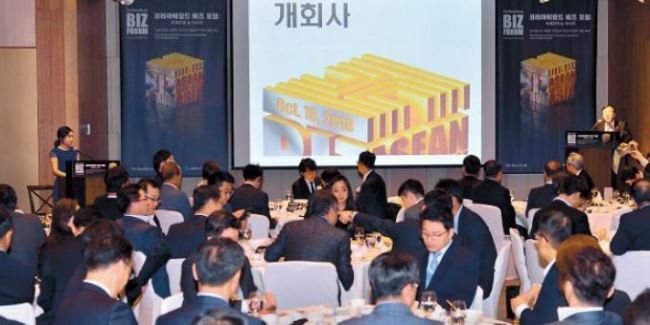 Around 200 attendees from political, business and academic circles on Tuesday shared views on the significance of economic cooperation with the Association of Southeast Asian Nations at The Korea Herald Biz Forum, applauding the forum’s discussion as “timely” in line with the increasing value of the Southeast Asian market not only for the Korean Peninsula, but also for the world. Kim Hyun-chul, chairman of the Presidential Committee on New Southern Policy, highlighted the forum’s significance in terms of geopolitical and economic changes Korea is experiencing at a time of the “three P’s” of prosperity, people and peace. The first “Korea Herald Biz Forum: ASEAN and New Asia” was held at Hotel Shilla in central Seoul, drawing attention from political circles and the business community with the new paradigm for economic cooperation in a “new era of peace” on the Korean Peninsula amid the favorable mood between the South and North. “As many politicians and experts addressed today, the forum’s topic about a new Asia with a focus on ASEAN was well chosen and fresh, providing the attendees with some new hope about new growth opportunities,” said an official from Hyundai Heavy Industries. Attending to deliver congratulatory speeches were leaders of the nation’s two largest opposition parties, Kim Byong-joon, chairman of the Emergency Committee of the main opposition Liberty Korea Party, and Sohn Hak-kyu, chairman of the Bareunmirae Party. The forum drew throngs of executive- and director-level officials from South Korea’s leading companies who have, or are considering, advancing further into the ASEAN market, including Samsung, LG, SK, Hanwha, Hyundai and their affiliates, along with Posco, Hyosung, KT, LS, Mirae Asset Global Investments, Shinhan Bank, KB Kookmin Bank, Korean Air, Kumho Asiana, Daesang, SPC, KT&G, Naver and Kakao, among others. Construction and heavy industries firms such as Daewoo E&C, Doosan Heavy Industries & Construction, GS E&C and Hyundai Development Company attended as well. Also present at the event were representatives of leading business groups, including Kim Jun-dong, executive vice chairman of the Korea Chamber of Commerce and Industry as well as members of Korea Trade-Investment Promotion Agency and Korea International Trade Association. Foreign-invested firms also expressed interest by attending, including members of GM Korea, Volkswagen Korea and Toyota Korea. Adding more depth to the discussion was the presence of foreign dignitaries representing Southeast Asian countries, who delivered presentations on the investment environment for their respective countries.